The deep red tones of the garnet gem fit in perfectly with the detailed princess cuts that they use. They are organized with care on this great two-stone "Only Us" ring with a 14k white gold body. The white gold is paired with 19 diamonds at 0.19 carats in weight all along the band. 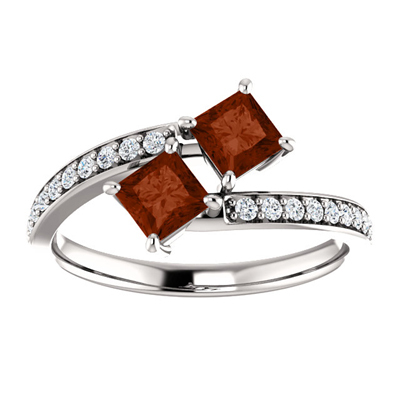 We guarantee our Princess Cut Garnet and Diamond "Only Us" 2 Stone Ring in 14K White Gold to be high quality, authentic jewelry, as described above.